I'm working hard to finish my next book and just finished a chapter looking at staff requirements for IT consulting in the 2020s. It struck me that some of us have quietly slipped into relying on a type of employee that many people don't even know exists: The Tech Admin. I think it's time for you to update your organizational chart to include this person. You'll need a job description. Eventually you'll use that to write a job ad. And that flows into your quarterly goals and quarterly evaluations. I have long advocated that an administrative assistant be your first hire. Most people try to hire a technician first, thinking that they will pay for themselves the fastest. But an admin costs a lot less and frees up the owner a lot more. An admin will be able to sort the mail, send out invoices, make deposits, prepare newsletters and marketing mailings, and a lot more. Basically, an admin will be able to take a bunch of $15/hour work away from the owner, allowing the owner to focus on $150/hour work! So What's a Tech Admin? A Tech Admin is someone who does less of the office admin work and more of the technology-related work. For example, my tech admins update Wordpress sites, edit videos, clean audio recordings, tweak my ClickFunnel pages, manage my social media reposting, and even create some graphics. The defining factor: They embrace technology and can do a wide variety of tech-related tasks. As a rule, they have training in all the standard "admin" skills such as Word, Excel, and QuickBooks. But they have also learned Photoshop, WordPress, and other basic technology. A Tech Admin will probably never become a technician in your service department. But she will be able to edit video and post it to your YouTube channel, manage your ConstantContact database, managed your Social Media presence, set up all of your clients on Hosted Exchange Mailboxes, create all those VOIP auto attendants, manage all client accounts in [Sherweb, Intermedia, Rackspace, AppRiver, etc.]. A Tech Admin is an administrative assistant who is not afraid of technology and would rather manage your cloud-based services than type your letters. It's someone who will do amazing things for your company in the $15 - $25 per hour range, and will be more productive than a technician at these things. As our businesses have morphed, we have turned over some very basic administrative jobs to technicians and service managers. These really need to be done by a Tech Admin - someone dedicated to this kind of work. You will save money and get a better job in the long run. There is nothing technical about setting up Office 365, cloud storage, anti-virus, spam filtering, and many other cloud services. Let the technicians install Office, configure the storage, deploy the AV, and set up the filtering. But don't pay technicians to do administrative work. Where Do You Find a Tech Admin? This is surprisingly easy. Start with a VA - virtual assistant. As we've been training technicians to do administrative chores, the average virtual assistant has been learning that the best jobs for them are all those chores with a technical component. For about ten years, a type of VA called a Techie VA has emerged. Virtually all VA's you find via Google search or on Upwork (www.upwork.com) are actually Tech Admins. So while you've been busy doing what you do for a living, a whole industry has popped up that is ready to take over a lot of your work - and do a better, faster job than your current staff. You can also "grow your own" Tech Admin, but that's going to take more of your time. You'll need to find someone looking for an admin job who has a lot of technical aptitude. You will probably be able to find someone closer to that $15/hr range. But you'll need to train them on a lot of the technical stuff. For many technology companies, it's probably better to find a VA who already does a lot of technical stuff and is willing to learn your specific routines. If you don't have good, documented processes, this is an employee who will help you move in that direction. Expect to pay closer to the $25/hr range. Also expect to commit to ten or twenty hours a week - or prepay for ten or twenty hours at a time. If you really need someone in-house because they need to do other chores around the office, you will probably need to plan on more training. If you are ready to turn over tasks to remote assistants, there will be less technical training. 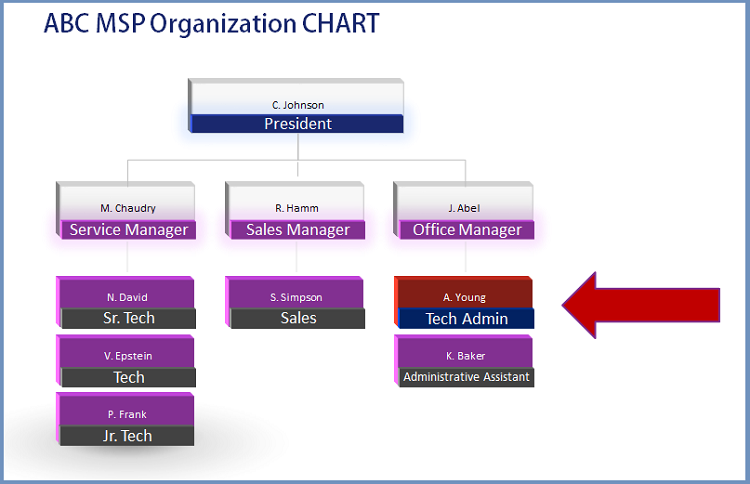 Either way, expect to add the Tech Admin slot to your org chart. Whether you do it sooner or later, I promise you this slot will be part of your org chart eventually. I recommend you jump in now.